Today, I have a special treat on the blog - a guest post from writer Nansubuga Nagadya Isdahl, as part of the Sing to the Moon blog tour. This is my first ever guest post on the blog, so I am also doubly excited. 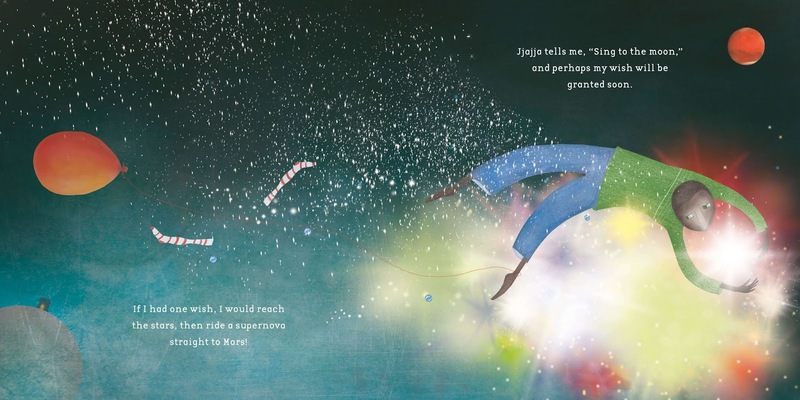 Here, Nansubuga Nagadya Isdahl shares the stories within the story Sing to the Moon, revealing the many layers and sublayers woven into this beautiful story about the relationship between a grandparent and their grandchild. I hope you enjoy reading this as much as I did - and thank you Nansubuga for sharing. 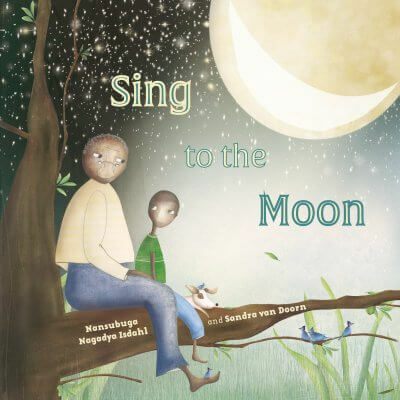 Sing to the Moon written by Nansubuga Nagadya Isdahl with illustrations by Sandra van Doorn is out October 11. Usually there are one or more (actually several) stories behind my stories and I think that is interesting and gives insight into my life and writing inspiration. While Sing to the Moon is ostensibly about a young boy discovering adventure through a rainy day spent with his grandfather, there are layers of memories (and thus stories) that I wove into the book. First and foremost, I wanted to honour my grandfather and other family members who have shared stories with me over the years. I think listening to family stories is one of the most important things we can do. All stories are important and interesting, but our own origin stories, cultural stories, and family stories are particularly important. To this day, I am struck by how much I still don’t know about my own family. And now that my grandfather has passed away, I deeply regret that I didn’t capture and listen more. I love how the young boy in the story learned about his grandfather's childhood. I wish I knew more about my grandparents' childhood. In this current time of preoccupation, I also wanted to honour the value of focusing on simple tasks. Now that I have my own family, all of those years of housework that I disliked as a child (and there were many of them!) have more or less paid off. I have patience for certain tasks – wanting to do them properly – that is a direct result of years of chores. In addition, doing a chore with someone you love – and using that time to connect can literally turn a ‘chore’ into a pleasurable experience. I think that’s a nice thing for kids to see, if they don’t already have that experience. Finally, I remember hearing the beat of drums from a faraway hill on several occasions while staying with an aunt of mine in Uganda. I also remember hearing people preparing meals, or speaking in hushed tones as they passed our window on their way home from work, etc. I often wondered about their stories. What were those drums? Where were those people headed? What were families preparing for dinner (I could smell the deliciousness, hear it being made, but I couldn't see it...)? I am totally inspired by the mundane actions of strangers and I like to weave pieces of their stories into my own. It’s just a reflection of how we live, in any case: picking up this and that from this and that and making it our own.